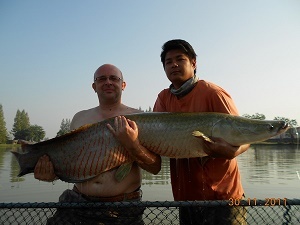 UK angler Paul started his Thailand fishing holiday with a visit to IT Lake Monsters Arapaima fishing and fishing for other monster predatory fish. Paul decided to fish with deadbait and livebait for the entire day and soon had a mackerel fillet cast out into the margins. It did not take long before the first predator of the day picked up the bait and powered off across the lake. After winding down into the fish the rod was bent double as the Redtail Catfish continued to hug the lakebed. Several minutes passed before the Redtail Catfish was finally brought to the waiting net and hoisted onto the grassy bank. The Redtail Catfish was estimated to weigh 15kg’s and as released after photography. Further casts resulted in a succession of Redtail Catfish which all fought every inch of the way to the net. Continued baiting seemed to hold the predators in the swim and saw Paul landing several Sorubim to 15kg’s. After a short break for lunch Paul resumed fishing and was soon into more predatory species landing several Alligator Gars to 18lb’s. Whilst holding one of the Alligator Gars the fish bucked wildly and managed to catch the angler on his arm drawing blood. After releasing the fish and some onsite first aid the angler was soon back amongst the Redtail Catfish landing a succession of monster catfish to an estimated 30kg’s. After a short lull in action Paul’s mackerel fillet was picked up by yet another predator which vacated the swim rapidly. This was what he was after, this was Arapaima fishing. The fight on this occasion was different to what the angler had previously experienced with the unseen predator wildly shaking its head to rid itself of the hook. The hook held firm and after several fraught minutes in the margins a stunning Arapiama was carefully steered into the waiting cradle. After allowing the fish time for recovery the angler proudly posed with his prize a beautiful Arapaima estimated to weigh 35kg’s. As the day wore on Paul added further predators to his haul of monster fish ith more Redtail Catfish taking a liking to his mackerel deadbait’s.